Legend has it, Manco and Mama, the children of the sun god Inti, journeyed for three generations to arrive at Cuzco. Upon their arrival, they plunged a golden staff into the ground where the earth sucked it in completely. This marked the completion of their task of fertilising the valley. Fortunately for us, today’s society is blessed with trains. Cuzco, meaning the centre of the earth in English, is the place that the Incans chose as their capital city. After the Spanish Inquisition, the city stands a cultural contradiction. This is one of the places where the fabled Inca trail trek begins. The best route for the first-timers on this journey is the popular classic trek. 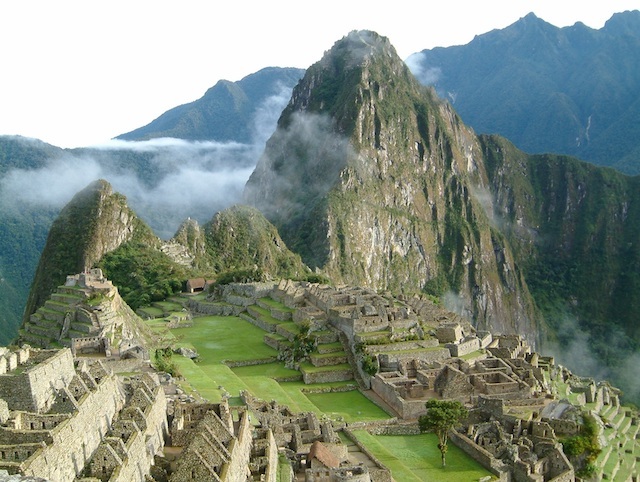 The Classic trek starts at KM 82 and ends at Machu Picchu. This is the 82 km marker on the train track from where the four days and three nights trail begins. This trek is really for enthusiasts of all shapes and sizes and of course all ages. However, there are just uncountable extremely interesting sites and places which you can explore while you are walking through this trail. Also, the landscape which you will be travelling through, will stun you with wonder and awe as you hike along. So pack your bags and let’s head to Peru! But before you leave, speak to a tour conductor. This is not optional as the trail is vast and you will need guides and porters and this headache is best-taken care of by a professional. Also, the tour company will ensure food and lodging along the way. Here are the places you will go through on your trek and the attractions that come in the way. Your journey begins. To commence the hike, first, you’ll have to take a bus to Ollantaytambo. This used to be a fortress and palace and it also stood up to the Spanish invaders. However, despite being subjected to a lot of torture and its historic age, it is incredibly well preserved. The first stop before Ollantaytambo is Moray. Moray used to be a sort of a laboratory for the Incas, now in ruins. From there, a downhill hike will take you to Maras, an old salt harvesting site covered with small pools. This is a rather unconventional path and chances of encountering fellow travellers are low to nil. The next stop, the town of Ollantaytambo is where you rest for the night. The ruins of granaries and temples and quarries are an impressive eyeful. You will be able to understand how advanced the Incas were for their time, when you see the intricate designs of these ruins with your own eyes. Say hello to you first morning while hiking the Inca Trail. You have a long day of walking ahead, so you need to get up early. After breakfast, you will need to take a bus to Piscaccucho (2750m), the KM 82 marker on the railway. To reach the first destination, Llactapata ruins (2650m), you have to walk for two hours crossing cosy rolling hills alongside the Urubamba River. The occasional glance above will reward you with a splendid view of majestic snow-capped peaks. From Llactapata, you will say goodbye to the Urubamba River and meet up with the Kusichaca River and finally reach Wayllabamba where you will tent up for the night. The tour conductor will most probably arrange for tents but you can buy one for yourself before coming. Wake up early and prepare yourself mentally while finishing your breakfast because this is the most challenging spread of land in the itinerary. A four to five hours walk will bring you the highest part of the trek Warmihuañusca (4200m) or as it is popularly known, the Dead Woman pass. Tread slowly and do not mess with it! Be humble and treat it with respect. Standing on the top you can see the rest of the trail in front of you. After a visit to the dead woman, you will have seasoned yourself on this trail and the rest should be a breeze. The next destination is a one to two-hour descent on stone steps towards Pacaymayo (3600). You will have to camp here for the night. The days’ time on the road is relatively shorter. A short yet steep path uphill will lead you to the circular ruins of Rakurakay. The circular nature of the ruins suggests religious implications. It might as well have been used as lookouts for scouts and guards. The demanding path continues for a while and then it goes downhill towards the Sayacmarca ruins (3580m). The ruins are not exactly on the trail but is a short climb near it and is worth the time and energy. Sayacmarca is a mysterious place filled with butterflies and hummingbirds. Here you are amongst the clouds. This used to be a dominant town of the Incas. Another hour’s walk will take you to a place where you can set camp. The journey from the campsite to the next destination is completely downhill and on steps made out of stones. The ruins of Phuyupatamarka or the city above the clouds have fountains that functioned as ritual baths in its day. From here you head on to perhaps the most significant ruin before Machu Picchu on the trail, Winay Wayna. Also the most beautiful spots in the entire trek, Winay Wayna has complex terrace systems that functioned in tandem with the agricultural system of the Incans. The steep hillside overlooks the Urubamba River. After another two to three hours you will cross Inti Punku or the Sun Gate, leaving it for the next day, and head on down to Machu Picchu, the lost city of the Incas. You can choose to stroll around the city or retire early and wake up the next morning to see the sunrise at Inti Punku. This is an event. There is a reason why it is called the Sun Gate. Wake up early and head on to Inti Punku. When you have thawed yourself after being petrified from the dazzling scenery, come down to the Incan city and head to the Machu Picchu Historical Sanctuary. Remember, the tickets sell out fast so book them at Cuzco itself. Once inside you will spend the entire day (till it closes at 5 pm). There are 400 paid hiking spots and it is advised that you take at least two days to cover Mt Machu Picchu and Wayna Picchu. From here you can take the train back to Cuzco and once there don’t forget to visit the Sacsayhuaman Fortress!